Over Super Bowl Weekend (Feb 1-2) some friends and I will be attending an Education Start-UP Weekend to develop tools that will help people bring more fun to work. 1) Tell us your stories: How did you or someone you know make an onerous task more fun? How do you teach others to do the same thing? 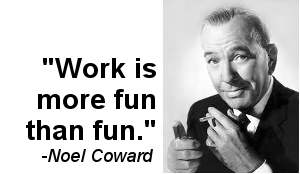 2) Tell us your needs: How could your work be more fun? 3) Tell us your ideas: How could employers make work more fun? How can employees do the same? How can job hunting be more fun? 4) Tell us how to help you: Our goal is to create something you can use whether you are doing work, looking for it, or managing others. Tell us how we can contact you when we have something to give you. At Start-UP Weekend events you are only given from Friday night at 6:30 until early morning on Sunday to come up with an idea, implement it, and launch it into the world. Early afternoon on Sunday we will need to present our project to a panel of judges. Although we appreciate your ideas no matter when you submit them, if you can get them to us by 6PM on Saturday, Feb 1, 2014 then we can include them in our project. Previous Previous post: What questions should we ask ourselves? Next Next post: How my life was changed when I began caring about the people I did not hire.